How can lower fat bags be removed without cutting the skin on the outside? 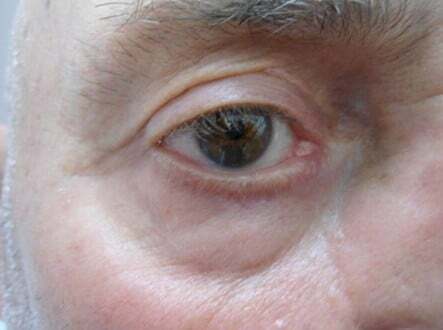 The fat that causes the bulge and the “tired looking shadow” is easily accessible from the inside surface of the eyelid. The laser makes a fine line and the fat pops out! No stitches and no visible skin marks. 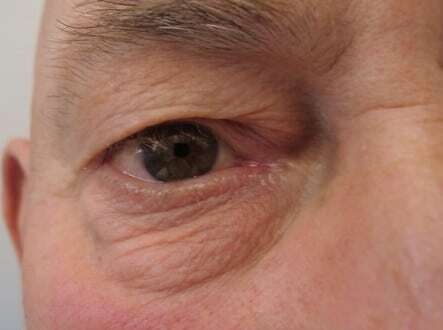 How is the drooping skin from the upper eyelids removed? 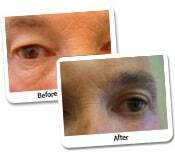 The extra skin that tends to hang down over the upper eyelid is removed by laser along the upper eyelid crease. The result is a more ‘open’ eye. Festoons are collections of fat often referred medically as the malar fat pad that becomes prominent on the upper cheek bone below the eye. WHAT IS THE CAUSE OF A FESTOON? Festoon is related to aging. It is caused by drooping and sagging of the fat that gets caught in a fibrous band on the middle of the cheek. HOW DOES A FESTOON LOOK? A festoon looks like a fold or roll of fat or curvature on the anterior front surface of the cheeks. It typically occurs in middle and old age. HOW CAN ONE TREAT FESTOONS? 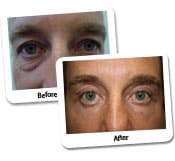 Lower lid blepharoplasty is performed through the internal inner surface of the lower eyelid. Sometimes the festoon can be pushed upwards towards the lower eyelid and the festoon can be removed from this approach using the CO2 laser. A mini face lift that tightens the muscle and lifts the skin of the outer cheeks can also improve or remove the festoon. Laser resurfacing tightens the skin and the underlying collagen and can cause the festoon to contract in and be much less obvious. 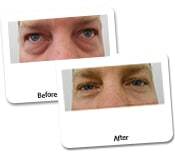 A filler, such as a hyaluronic acid, can be used around a festoon to make it less obvious. Sometimes, the bulging of the festoon can actually be used to enhance the youthful curvature of the cheek together with the injection. DO YOU COMBINE THE OPTIONS? Yes. It is very common to combine the treatment options in order to get the best result. WHY DO FESTOONS LOOK BAD? Festoons look bad because a natural and youthful cheek has a smooth convex curvature. An abnormal lump in the middle of the cheek gives an unusual appearance and casts a shadow on the middle of the cheek which creates an appearance of tiredness. WHAT IS THE MAIN CAUSE OF FESTOONS? Festoons are mostly caused by general aging which is determined by sun exposure, facial movements, and genetics. WHERE ARE THESE PROCEDURES PERFORMED? Dr. Lanzer performs the procedures at a day surgery center. Dr. Lanzer’s surgical center has received the ISO 9001:2088 accreditation together with the 10 Standards for National Safety and Quality in Healthcare Standards (NSQHS). These standards were introduced in 2013 and Dr. Lanzer was one of the first day surgery clinics to receive the full award and probably the first cosmetic center. This means that Dr. Lanzer is focused on safety and good quality care. 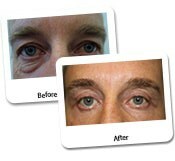 View more Eye Rejuvenation Surgery Before and After Photos available. Dr Lanzer has found that the best and most natural results can be obtained by combining multiple procedures. Each procedure is directed at a particular issue and thereby produces the best overall result. Dr Lanzer has found that combining a number of focused procedures he can obtain an excellent natural result. Dr Lanzer has over 30 years of Cosmetic Surgery experience and is regarded as one of the leading Cosmetic Surgeons in Australia. Dr Lanzer is skilled in Liposuction, Breast Augmentation and many other Cosmetic Surgery procedures. Surgical Warning: Every form of surgery has a possibility of a complication and these are given to you in detail by Dr Lanzer. It is a good idea to understand your surgical procedure well, and to obtain further advice from another Specialist Cosmetic surgeon such as a Dermatologist like Dr Lanzer. "All photographs represent one person's experience, and results may vary for each patient. 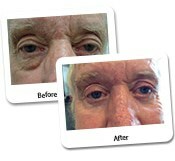 All photographs are of actual patients of Dr Lanzer. 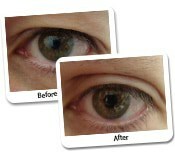 The visible change in these photographs has occurred as a result of the procedure/s undertaken. Some before and after photos shown are not exact, in that they vary in light, contrast, clothing, background, distance from camera, hairstyle and make-up." Please use the form below to enquire or request a consultation at Dr Lanzer Surgery. Please Email me about new developments & special offers. Copyright ©2019 Dr Lanzer. All rights reserved, Melbourne, Australia.